(21.10.2016) A number of agreements have been signed by AlHuda Centre of Islamic Banking and Economics - UAE in Maldives for the development of Islamic Banking and Finance according to which AlHuda CIBE will guide and assist Maldives Centre for Islamic Finance (MCIF) and Islamic University of Maldives (IUM) in research, education, technical issues and others. The agreement ceremony took place in Male, the capital city of Maldives. 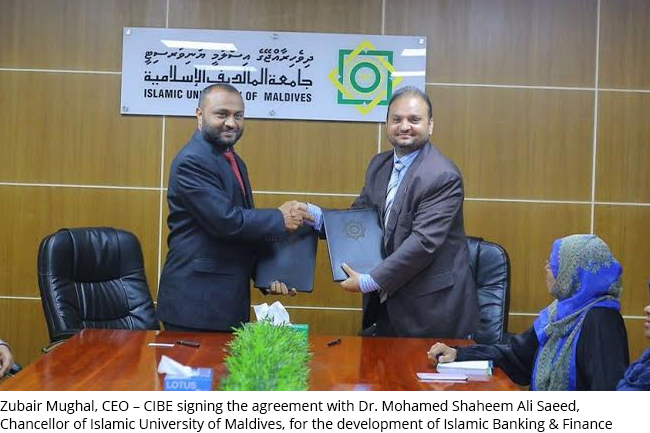 Dr. Mohamed Shaheem Ali Saeed; Chancellor Islamic University of Maldives, Ibrahim Didi; Managing Director of Maldives Centre for Islamic Finance, Government of Maldives and Muhammad Zubair Mughal; CEO of AlHuda Centre of Islamic Banking and Economics separately signed the agreements. During his speech in the agreement ceremony, Mr. Zubair Mughal stated that there are a lot of opportunities for the promotion of Islamic finance in Maldives which can bring a very positive change in the economy of Maldives. Huge FDI can be introduced easily in the country. He further added that Maldives has all the resources through which it can guide the regional countries including India, Sri Lanka, Thailand, etc. with the knowledge of Islamic finance. Pointing towards Luxembourg he said that the size of a country does not matters to make it a financial center. So Maldives can be the future regional center of Islamic Banking. He further added that with the promotion of Islamic economy in Maldives, not only Islamic banking and finance will grow but Halal Industry, Halal Tourism and individual power will also enhance. Government can get financial resources in the form of Sukuk for its plans and through Halal Tourism millions of tourists can be attracted towards Maldives. He further said that for the last 12 years AlHuda CIBE has served more than 20 countries for the promotion of Islamic finance. The main purpose is to promote Islamic finance and to provide this world with a strong financial and banking system which is only possible through Islamic banking and finance.